Gareth Southgate's England scouting trips have been further afield recently - and it has a lot to do with top English talent making waves in Germany. Teenagers Jadon Sancho and Reiss Nelson are tearing it up in the Bundesliga for Borussia Dortmund and Hoffenheim respectively. Former Manchester City prospect Sancho, 18, has five goals and eight assists in 15 appearances for BVB this season - enough to earn him his first full England cap. Arsenal loanee Reiss Nelson is another top English talent doing positive things in Germany. The 18-year-old has scored five goals in six league appearances for Hoffenheim, bagging his first just 14 minutes into his debut. Only one other foreign teenager has ever scored more goals in a Bundesliga season than Nelson, and that was Ousmane Dembele whose six goals in 2016-17 for Borussia Dortmund earned him a £96.8m move to Barcelona. So will we see him return to north London to grab a spot in Unai Emery's first-team squad soon? "At the moment I'm very happy here... I'm playing, I'm scoring," he told Bundesliga.com. "But I'm an Arsenal player at the end of the day, so I have to stay and do my job here, then wherever football takes me, I'll go." 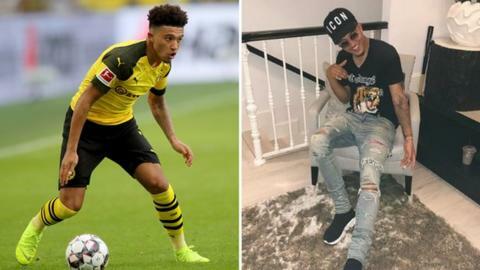 But the best news for England fans is that there are more potential 'wonderkids' following in Sancho and Nelson's footsteps, who could be the next to take European football by storm. Six feet tall, left-footed, former Spurs winger - sound familiar? Keanan Bennetts' performances for Borussia Monchengladbach's youth side have earned him comparisons to Real Madrid superstar Gareth Bale. Bennetts signed a four-year contract for the Bundesliga side in June 2018 and immediately made an impact by scoring twice on his debut for the club's reserves, who compete in Germany's fourth tier against professional adult teams. The London-born Bennetts' Hamburg-born mother taught him German growing up. Being fluent in the language made the transition to The Foals an easy one, but means he may have a tricky decision later in his career - the 19-year-old could represent England, Germany or Nigeria at senior international level. Will there be a three-way fight for his allegiance? Mandela 'Manny' Egbo took the plunge early in his career, moving to Germany from Crystal Palace's youth squad aged 17. He doesn't seem to have looked back - now 21, the defender has played 878 minutes this season alongside Keanan Bennetts for Borussia Monchengladbach's reserves. He made his Bundesliga debut in February playing 10 minutes in a 1-0 victory over Hannover. Egbo told The Independent it was an easy decision to move to Gladbach as there was "a clear pathway for young players". He added: "It it was a bit of a no-brainer to come out here to get game-time in an amazing league and with an amazing team and try to push for the top of the top, which is European football and those European nights." Former Chelsea academy graduate, Jonathan Panzo was a member of the England Under-17 side who beat Spain in the World Cup final last year. Born to Ivorian parents in south London, he was already a competent French speaker before sealing his move to Ligue 1 side Monaco at the start of July. Panzo, who turned 18 in October, won five trophies in his final season in London - including the club's fifth successive FA Youth Cup. He has since made six appearances in Monaco's reserve side who play in France's second division, and now can look to impress new manager Thierry Henry in a bid to make the first team. Panzo was also a reported target of Juventus, Borussia Monchengladbach and Valencia but chose to hone his craft on the French Riviera. At just 16, Noni Madueke is the youngest on this list. The attacking midfielder reportedly turned down professional contracts with Tottenham (where he had been playing for the under-18s at just 15 years old), and Manchester United, to join Dutch top-flight side PSV Eindhoven. "I sat down with my family and thought that coming from England to the Netherlands was going to be the best for my development," he said. Madueke starred in the Uefa Youth League for Spurs and was also named player of the tournament in the 2017 Sonnenland Cup - an indoor European youth tournament in Germany.